The duo consisting of Sandra Reemer and Dries Holten. When they started working together in 1968, they both had full careers behind them: Sandra as a teen pop star and Dries Holten - with Dutch "carnival" repertoire. Besides that, he'd recorded together with the Jolly Jokers and as Andy Wood. 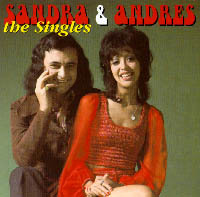 Sandra and Andres split up after a great number of hits in 1975 and both went solo. Something in my heart/ ? Sandra Reemer was born in Bandoeng and was launched at the start of the 60s as a child star, but she proved her longevity on the scene. In 1968, she sang at the Knokke Song Contest and participated several times in the Eurovision Song Contest (1972: with Andres; 1976: as Sandra Reemer; 1979: as Xandra). Besides that, from 1968 to 1975, she was one half of the duo Sandra & Andres with Dries Holten. The group Xandra featured Ton op 't Hof (dr), Mac Sell (g), Paul Vink (o, p) and Ferdy Lancee (g) and didn't last very long. Having accompanied his sister Sandra between 1960 and 1966 as a guitarist, Frank went on to making his own records as Franky, Justin Frank and under his own name. In 1976, he was a member of Radar for a short period of time. After the breakup of Sandra & Andres, Dries Holten formed this duo with Rosy Pereira. The duo existed from 1975 to 1978. LP Nothing's gonna change ?